Avery Friends is focused on growing, deepening, and enriching Avery's commitment to architectural and fine arts collections and research. Membership in Avery Friends helps us to maintain and enrich Avery's remarkable collections to make our resources accessible to a wider audience, and to preserve these important works and our historic library building as part of our shared legacy. 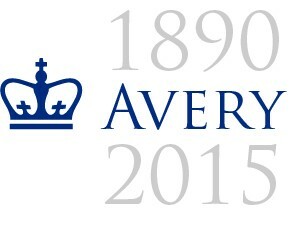 Support Avery Library by becoming an Avery Friend: Fill out a secure form online or mail your gift to the below address.